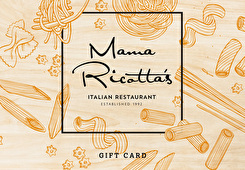 Charlotte's definitive home style Italian restaurant, Mama Ricotta's has become an institution, garnering both regional and national attention and praise. At the top of Charlotte's list of most beloved restaurants, Mama Ricotta's is consistently voted Best Italian Restaurant and has served up scratch made family favorites for over twenty solid years. FS Food Group designs and operates award-winning restaurants, including Mama Ricotta's, YAFO Kitchen, Paco's Tacos, and Midwood Smokehouse. With 4 different concepts and counting our gift cards are the ideal gift this holiday season! For balance inquiries call the phone number to a Mama Ricotta's 's location below.